The national market for foreclosed homes remains strong. According to foreclosure data firm RealtyTrac, foreclosure activity increased 1 percent in August as compared to the month prior, climbing to just above 193,500 units nationwide. 1 in every 681 U.S. households received some form of foreclosure filing last month where a “foreclosure filing” is any one of the following foreclosure-related events : A default notice on a home; a scheduled auction for a home; or, a bank repossession of a home. Default notices climbed in August which indicates that more U.S. homeowners are falling behind on payments. However, for the 22nd consecutive month, the number of bank repossessions fell. This suggests that lenders are reaching alternative outcomes to foreclosure more frequently, and with more success, reducing the number of homes for sale nationwide. Fewer homes for sale is one reason why U.S. home prices have been rising. Like everything in real estate, though, foreclosures are a local event. In August, just six states accounted for more than half of the country’s bank repossessions. 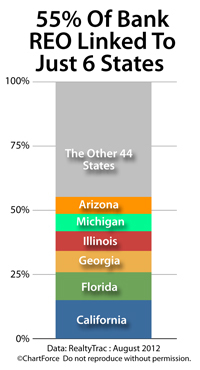 Those six states — California, Florida, Georgia, Illinois, Michigan and Arizona — account for less than 31% of the U.S. population. Clearly, foreclosures remain concentrated. However, bank-owned homes can still make for “good deals” across all 50 states. This is because foreclosed homes are typically sold at steep discounts versus comparable, non-distressed homes. Just be sure to do your foreclosure research first. Buying a home in foreclosure is different from buying a home not in foreclosure. The contract and negotiation phases are different, and foreclosed homes are often sold as-is. “As-is” is real estate-speak for “this home may be defective and/or uninhabitable”. Therefore, if you plan to buy foreclosure, talk with a real estate professional first. You can learn a lot about a foreclosure by doing research online. However, when it comes time to write a contract, you’ll want to have an expert on your home-buying team.